Enjoy this creative Halloween cookie recipe and a delicious pumpkin bars recipe to help you make your Halloween get-together a little more Spooktacular and fun! Not everyone celebrates Halloween, I know. But for those of you who don't, these delicious and clever recipes can be adapted to other occasions, so you won't have to miss out on the fun. There's no reason why you can't use this Halloween cookie recipe for "monster eyeballs" to liven up a kids party any time of the year. 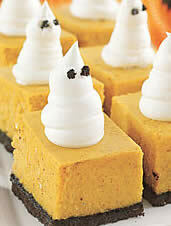 And these simple but delicious pumpkin bars? Well, they'd be wonderful for a harvest party, Thanksgiving, or even added to your Christmas goodies menu. We've had a lovely start to the new CCM store with several vendor's signing up and beginning to list their goodies for sale. I couldn't resist ordering a few treats for my family and I've already had fantastic feedback on some of the fudge. I treated my brother to a selection of fudge from the vendor "My Favorite Fudge" and got rave reviews. In fact, my sister-in-law wrote, "that fudge was so doggone good. Your brother said that he was going to have a diabetic attack. lol"
Take a few minutes to look over these new vendors, and don't forget; If you want to sell your own goodies, use this Vendor's Guide and get started before the holiday rush! I wanted to locate a fun Halloween cookie recipe that the kids would really love to make and to eat. I think I found a winner at myrecipes.com. 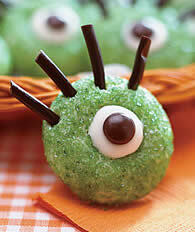 These "monster eyes" cookies are so cute, but yet they are not at all difficult to make. Preheat your oven to 350°F. In a mixing bowl, cream butter and sugar. Add the egg yolk and vanilla next, then the flour and salt, mixing until well combined. Roll your mixture into the shape of eye balls (about 1 inch in size). Gently roll the eye balls in the green sugar to coat and then place on your baking sheets. Bake for 12 minutes. If you are baking two sheets at one time, rotate the sheets half way through. Remove the cookies from the oven and push a slight indent into each center. Using the licorice pieces, form "eyelashes" on each monster eye and return to the oven for another 2 minutes. Place one white chocolate chip in the center indent and return to the oven for the final 3 minutes. As soon as you remove them from the oven push a mini M&M into the center of the white chip for the pupil and allow to cool completely. If you are letting the kids create their own monster eyes with this Halloween cookie recipe, please be sure to caution them about burning their hands on the hot baking sheets while adding all the fiddly bits. While looking for a good Halloween cookie recipe the kids would love, I couldn't help but notice this delicious pumpkin bars recipe that I would love! It's like a pumpkin cheesecake. Mmmmm! This one is from myrecipes.com, too, and as mentioned earlier, can be made up for any occasion that you'd like to indulge in a little spicy pumpkin treat. You can either whiz up the cookies into crumbs in your food processor, or do what I do and put them in a Ziploc bag and give them a good bashing with a mallet or rolling pin. Mix in the butter and press the crumbs into an 8" baking pan that has been lined with foil and lightly sprayed with cooking oil. It's a good idea to allow the foil to hang over the edges so that you can easily lift-out later. Bake the cookie base in a preheated 350 degree oven for about 10-12 minutes. Remove and allow to cool, but leave the oven on for the rest of the baking process after you make and add the filling. Beat together the cream cheese and the sugar for about 2 minutes until nice and smooth. Beat in the pumpkin and the eggs, one at a time. Add the vanilla, flour, spices and salt, beating just until it is all combined. Pour mixture into the baking pan on top of the base you prepared. Set the 8" pan into a larger baking pan and put it in the oven. Pour hot water into the outer larger baking dish until nearly full. This will allow the cheesecake part to cook properly. Bake for about 45 minutes or until cheesecake is set around the edges and jiggles a little in the middle. Remove from oven and place the inner baking pan onto a cooling rack to set until cool. Chill in fridge until completely firm (minimum 3 hours). Lift cheesecake from pan. Cut into bars and serve. If you are preparing this for Halloween, pipe some Cool Whip (or whipped cream) on top before serving and add two mini chocolate chips for their ghostly eyes! I hope you enjoyed this issue of Charmingly Chocolate with the clever Halloween cookie recipe for "Monster Eye Balls" and the equally yummy Halloween Pumpkin Bars. If you have any feedback or comments you'd like to share with me, just reply to this zine and let me know. And don't forget to check out our new Chocolate Candy Mall Store! 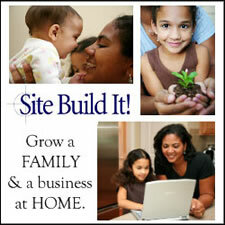 Interested in building your own site for business or pleasure? Learn from the best like I did, choose SBI.